This week’s InnoTrans trade show in Berlin illustrates the growth of SPD-SmartGlass in the rail industry, with solutions that improve the passenger experience and benefit train operators. 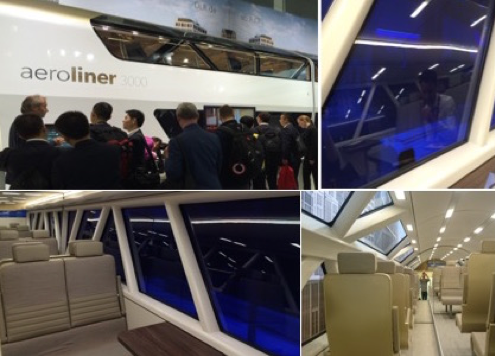 Train manufacturers, operators, and train window suppliers primarily in Europe and Asia have all been working with Research Frontiers’ patented SPD-SmartGlass technology which allows passengers and crews, at the touch of a button, to change the tint of the windows on a train. The windows also interface with climate control systems for automated control. This technology enables control and management of heat, light and glare coming into railway cars to make train cars more comfortable, safer, quieter, and more energy efficient. By using SPD-SmartGlass technology, passengers and crews can “tune” the amount of light coming into the train to preserve and enhance views and reduce unwanted glare. Innotrans, the leading international trade fair for transport technology, is the stage for the world premier of new electronically dimmable window (EDW) solutions using SPD-SmartGlass technology. AGC, and Vision Systems, both licensees of Research Frontiers, launched their respective latest generations of SPD-SmartGlass EDWs for the rail industry. These “smart windows” control and manage both beneficial and undesirable outside elements entering train cars through passenger windows. Vision Systems also unveiled another new solution, “Info-Vision” window, which integrates an electroluminescent display into the SPD-SmartGlass EDW. Most trains with traditional window shades have passenger windows that are also highly tinted, in an attempt to reduce the amount of time the shades must be down due to excessive light, glare or solar heat. While this reduces somewhat the time the shades have to be down, it remains ineffective for many lighting conditions. Even when the shade is up, the tint of the window limits the passengers’ views outside the train during dusk, nighttime and pre-sunrise hours. SPD-Smart windows eliminates this problem with its ability to be in an optically clear state. SPD-SmartGlass EDWs dramatically improve the passenger experience, by instantly and precisely managing the optimum amount of healthy daylight for passenger comfort and well-being, and rejecting uncomfortable heat and noise. Also, an important feature of the passenger experience onboard trains is experiencing the magnificent views. With windows using traditional shades, views are blocked at all times sunlight, glare or heat are uncomfortable. SPD-SmartGlass is the solution, by enabling passengers to instantly and precisely “tune” the window’s tint to a level that allows them to continue to enjoy views yet remain extremely comfortable, even in direct sun. In a Vision Systems press release, their Nuance product line of SPD-SmartGlass solutions using their new generation technology were reviewed. EDWs with integrated control system electronics (on the passenger window EDW itself), for rapid installation in both new train car production, and retrofitting existing train cars. SPD-SmartGlass solutions for the driver cabin, to eliminate glare on the dashboard with side and back window EDWs, and/or SPD sun visors integrated into the windshield. “Info-Vision” window, which integrates an electroluminescent display into SPD-SmartGlass windows. This combines the benefits of the EDW with information available directly on the window, such as time to destination, remaining distance, temperature, service options, and train schedules. At top: Vision Systems booth at 2018 Innotrans, and Info-Vision window integrating an electroluminescent display into an SPD-SmartGlass electronically dimmable window (EDW). At bottom: Vision Systems Nuance V2 Multizone SPD-SmartGlass EDW, with various zones being controlled for maximum comfort. We invite you to read the Vision Systems press release for more information. Vision Systems was one of the first companies to introduce their Nuance brand of SPD-Smart windows and its benefits to the train industry. Their Nuance solution was installed on the mockup of Aeroliner 3000 by Vogler Studio two years ago with the first generation of dimmable windows. The second generation of this solution is currently in production for two new main train projects. Full-scale mockup of the AeroLiner3000, with Vision Systems Nuance brand of SPD-Smart EDWs (Electronically Dimmable Windows) – shown in a darkly tinted state at top right and bottom left. In addition to the above information, Vision Systems confirmed at Innotrans that they were working on other high volume train projects with major commuter train manufacturers and operators. Vision Systems also has a presence at AGC’s Innotrans booth. AGC is presenting a complete passenger window integrating Vision Systems’ SPD-SmartGlass dimmable solution. View the Continental press release for more information and a simulation of the system in action. Note: From time to time Research Frontiers may issue forward-looking statements which involve risks and uncertainties. This press release contains forward-looking statements. Actual results could differ and are not guaranteed. Any forward-looking statements should be considered accordingly. “SPD-Smart and “SPD-SmartGlass” are trademark of Research Frontiers Inc. “Nuance,” “Nuance V2,” “Nuance V2 Multizone,” and “Info-Vision” are trademarks of Vision Systems. WONDERLITE is a trademark of AGC.